Ask for price - Weight: 1.9 t - Hours: 1,130 h - General good condition used equipment, ready for use. - Skid steer loader in 2001. Weight: 2.8 t - Hours: 4,000 h - Reg. number: 3219 - Forks - Skid steer loader in 2003. Ask for price - Weight: 2.8 t - Hours: 1,992 h - General good condition used equipment, ready for use. - Skid steer loader in 2006. Ask for price - Weight: 2.8 t - Hours: 3,086 h - General very good condition used equipment, ready for use. - Skid steer loader in 2010. Ask for price - Weight: 3.2 t - Hours: 1,400 h - General good condition used equipment, ready for use. - Skid steer loader in 2005. Ask for price - Weight: 3.4 t - Hours: 0 h - General good condition used equipment, ready for use. - Skid steer loader in 2001. Ask for price - Weight: 3.2 t - General good condition used equipment, ready for use. - Skid steer loader in 2015. 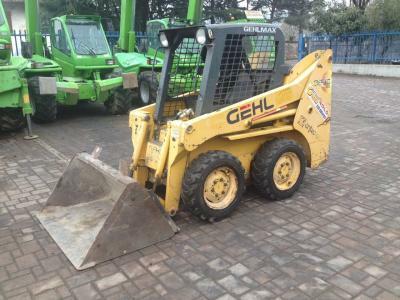 Ask for price - Weight: 1.8 t - General very good condition used equipment, ready for use. - Skid steer loader in 2000. Weight: 2.8 t - Hours: 884 h - Reg. number: 4499 - Machine just cut and in good condition. - Equipped with a closed operator cabin with front door, - Provided with a bucket without teeth and with road - Skid steer loader in 2007. Weight: 2.9 t - Hours: 215 h - Reg. number: 312034 - 215 genuine hours Concrete mixer bucket included in the price Docs Servocontrola - Skid steer loader in 2010. Ask for price - Weight: 2.9 t - Hours: 1,587 h - Reg. number: 308509 - Bucket â Turbo âlicense plate - booklet- High flow â Spare Wheel - Skid steer loader in 2006.